The major Spanish transhipment hub Algeciras increased its liner connectivity by 20.5% in 4Q 2017 as compared to the previous quarter, becoming the second of all the global container ports, just after Singapore, with the highest rise in the number of direct service connections. This was revealed in the latest edition of Drewry’s quarterly Ports and Terminals Insight Report. In the last quarter of 2017 the two container terminals of Algeciras increased the number of mainline services by 8, from 39 to 47 services per week. 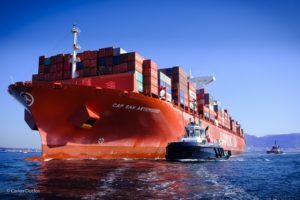 This was achieved due to adding two new calls: the CMA CGM/Hapag-Lloyd NEMO/EAX service which links Europe with Australia and also makes calls at ports in North Africa, the Indian Ocean and India; and the Maersk Line FEW7 service from Asia to West Africa calling the Middle East (Oman) on the way. This allowed Algeciras enter the list of TOP 20 global ports with the highest liner connectivity index, ranking 18th. This list is topped by Shanghai, which is directly connected by services to all six world regions and has the highest number of mainline service connections per week, 172 in total. The European ports are represented in the TOP 20 list by Rotterdam (#11, 62 services per week), Antwerp (#12, 61 services per week) and Algeciras. 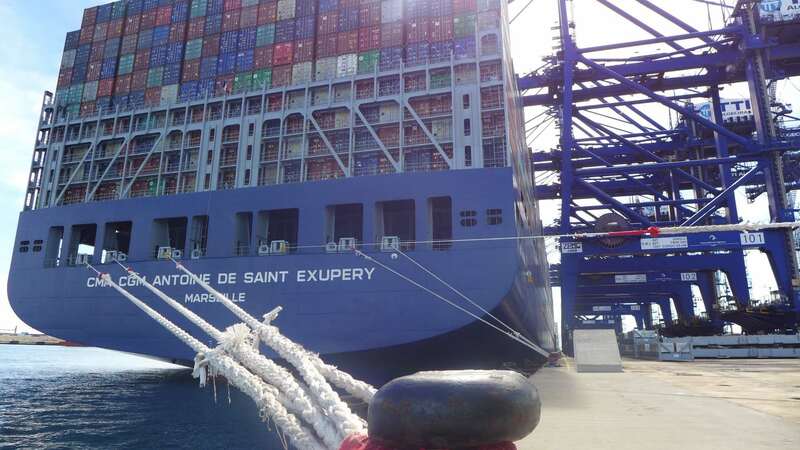 Last week Algeciras welcomed the largest container vessel in its history. The 20,776 TEU CMA CGM Antoine de Saint Exupery called TTI Algeciras on 7 March on its inaugural voyage from Singapore. The mega-ship, delivered to CMA CGM in January this year, will be employed on its FAL 1 service linking Asia with North Europe via Spain. Announcing the February 2018 results, the Algeciras Port Authority informs that this has proved to be an exceptionally good month in terms of the handled volumes. The total throughput was up 22.7% (8.6 mln tonnes) and the container traffic surged by 36.8%, up to 392,168 TEU. This brings the January-February box volumes to 751,271 TEU (+10.6%). The port highlights the growth in the number of full import containers (+26.9%) and in the number of handled vessels up to 559, from 514 that were served in the first two months of 2017. These days the port is promoting its services at the Intermodal South America exhibition that runs in Sao Paulo, Brasil, on 13-15 March.